Please remember to enter AGENT10-012 in the coupon section at the checkout to save 10%. 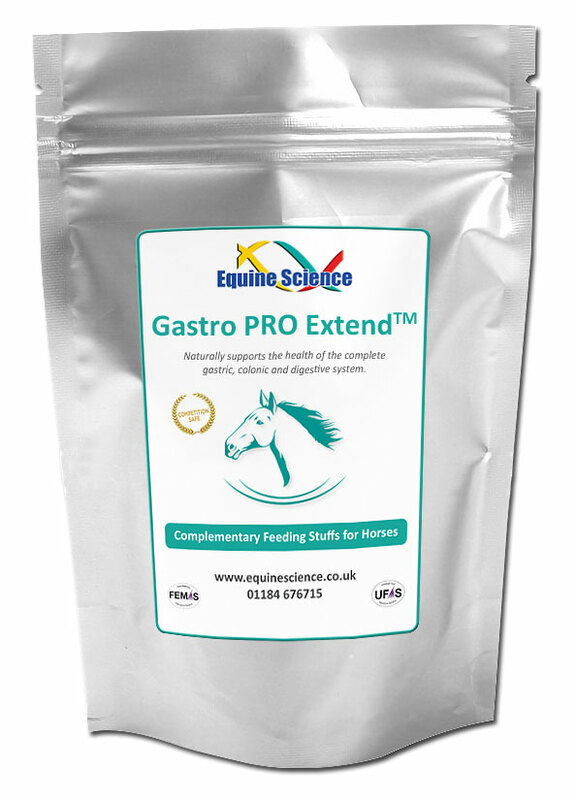 Gastro PRO Extend™ has been designed and formulated to provide a step down in strength to be used after using Gastro PRO™ or as a step up in strength as and when required from the SFM PRO™. Based on the same formula design as Gastro PRO™ it still nutritionally and naturally supports the health of the complete gastric, colonic and digestive system. Like Gastro PRO™ is still supplies active nutrients, utilises Nitric Oxide precursors and encourages the natural production of mucus in the lining of the gastric system, therefore acting as a buffer to splashing acid and maintaining stomach acidity levels. It does not interfere with the acid production required for healthy digestion in the hind gut. Does not contain chemicals, fillers, binders or other known prohibited substances as defined by the FEI. Soy Flour, Flax Meal, Papaya, L-Arginine, L-Alanine, L-Methionine, Turmeric, L-Tyrosine, Liquorice, Himalayan Salt, Algae-Spirulina, L-Carnitine, Vitamin E, Vitamin C, Vitamin B3, Vitamin B6, Vitamin B5, Vitamin B2, Iron, Cordyceps, N-Acetyl-L-Cysteine, Lecithin, Vitamin D3, Zinc, Citrus Bioflavonoid, Vitamin B12, Vitamin B1 (Thiamine), Vitamin A, Biotin. Please remember to enter AGENT10-012 in the coupon section at the checkout to save 10%. 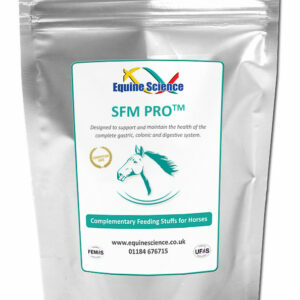 Excellent for every horse’s daily needs, our SFM PRO™ range are all-inclusive formulas and have been designed to provide the essential nutritional building blocks for the healthy horse using natural superior vitamins, minerals, and herbs of the highest quality. It can be used as a step down in strength after using Gastro PRO™ or Gastro PRO Extend™ or it can be used as a daily supplement which has been formulated especially to nutritionally support and maintain the health of the complete gastric, colonic and digestive system in a natural way. It does not interfere with the acid production required for healthy digestion in the hind gut. Does not contain chemicals, fillers, binders or other known prohibited substances as defined by the FEI. Composition: Soy Flour, Flax Meal, L-Arginine, L-Alanine, Vitamin E, Vitamin C, Lecithin, Turmeric, L-Tyrosine, Iron, Cordyceps, Algae-Spirulina, N-Acetyl-L-Cysteine, Zinc, Manganese, Himalayan Salt, Vitamin A, Vitamin D3, L-Carnitine, Vitamin B1 (Thiamine), Vitamin B2, Vitamin B3, Vitamin B5, Vitamin B6, Vitamin B12, Biotin. Please remember to enter AGENT10-012 in the coupon section at the checkout to save 10%. Muscle Balance™ is a powerful everyday complete supplement combining natural, superior vitamins, minerals, amino acids, herbs, antioxidants and naturally occurring probiotics of the highest quality. This formula is designed to help a horse cope with the stresses and strains of daily work. Helps support the increase of lean muscle, while adding weight, increasing water intake, stamina and supports a faster recovery time. Especially good for young horse development. Natural ingredients help maximize your horse’s full potential and bring your hard keeper to a healthy weight. Does not contain chemicals, fillers, binders or other known prohibited substances as defined by the FEI. Composition: Soy Flour, L-Arginine, Flax Meal, L-Alanine, L-Valine, L-Proline, L-Ornithine, Algae-Spirulina, Liquorice, Lecithin, Vitamin D3, Citrus Bioflavonoid, Milk Thistle, Ginkgo, Papaya, Cinnamon, Vitamin C, Cordyceps, L-Methionine, Ginger, Vitamin E, Turmeric, Ginseng, Iron, Himalayan Salt, N-Acetyl-L-Cysteine, L-Tyrosine, L-Carnitine, Schizandra, Zinc, Manganese, L-Glutamic Acid, Vitamin B6, Vitamin B12, Vitamin B1 (Thiamine), Vitamin B2, Vitamin B5, Vitamin B3, Vitamin A, Biotin. Please remember to enter AGENT10-012 in the coupon section at the checkout to save 10%. Muscle-EZ™ is formulated using a potent mixture of natural vitamins, minerals, herbs and amino acids and is designed to support the nerve and muscle health for optimum performance and recovery.Ideal for horse’s where muscle health needs additional support. Does not contain chemicals, fillers, binders or other known prohibited substances as defined by the FEI. Composition: Soy Flour, L-Arginine, Flax Meal, L-Alanine, L-Valine, L-Proline, L-Ornithine, Algae-Spirulina, Liquorice, Lecithin, Vitamin D3, Citrus Bioflavonoid, Milk Thistle, Ginkgo, Papaya, Cinnamon, Vitamin C, Cordyceps, L-Methionine, Ginger, Vitamin E, Turmeric, Ginseng, Iron, Himalayan Salt, N-Acetyl-L-Cysteine, L-Tyrosine, L-Carnitine, Schizandra, Zinc, Manganese, L-Glutamic Acid, Vitamin B6, Vitamin B12, Vitamin B5, Vitamin B3, Vitamin A, Biotin. Please remember to enter AGENT10-012 in the coupon section at the checkout to save 10%. It is important to support the tendons, bones, and cartilage essential to healthy movement. JointPlus PRO™ is a concentrated daily supplement which aids lubrication to the joints, supports soft tissue and contains important amino acids for collagen production necessary for healthy joints and movement. Contains a combination of natural superior vitamins, minerals, and herbs of the highest quality that provides the essential nutritional building blocks for the healthy horse. This super joint supplement is perfect for your competitive horse. Does not contain chemicals, fillers, binders or other known prohibited substances as defined by the FEI. Composition: Flax Meal, L-Arginine, Soy Flour, Turmeric, L-Methionine, L-Proline, Citrus Bioflavonoid, Cinnamon, L-Valine, L-Ornithine, Manganese, Chilli, Zinc, MSM, Iron, Vitamin C, Himalayan Salt, Vitamin B1 (Thiamine), Vitamin B2, Vitamin B3, Vitamin B5, Vitamin B6, Vitamin B12, Biotin.